The public school system in San Diego County serves over 450,000 students. In addition to academic excellence, area schools offer extensive vocational training, special education for the handicapped, remedial studies and programs for children with learning disabilities, special education resources for gifted and exceptionally talented students, career centers, and outstanding educational opportunities for adult continuing studies. In 2012, The Preuss Middle and High School, UCSD, was named the top charter school in California. 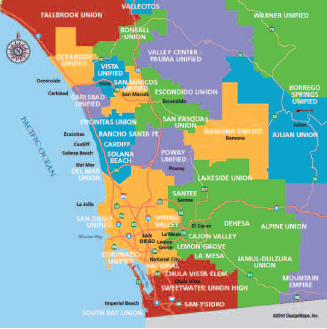 San Diego County has over 200 private and parochial schools, ranging from neighborhood preschools to nationally recognized college preparatory academies. Enrollment and transfer requirements for all public school students in California are: birth certificate, last report card and transcripts from previous school, plus proof of immunizations. A child must be 5 years of age on or before December 1 to be eligible for kindergarten. For a referral of state approved family day care providers, contact the YMCA Child Care Resources Service at 800-481-2151 or visit www.ymca.crs.org. The Southern California region has over 100 institutions of higher learning. Nearly 45 per cent of adults in San Diego County over the age of 25 have some college education. One in three has at least a college degree. As a white-collar town, San Diego has comprehensive sources of higher education. The County is home to six universities, 32 colleges, multiple community college districts and 250 post-secondary schools. Over 200,000 persons are currently attending colleges and universities in San Diego. Research and development monies from the federal government are plentiful. As a world-wide hub for the high tech, telecom, biotech and biomed businesses, more than 300 private firms conduct research under government contracts. Currently, five Nobel Prize winners live here. UCSD ranks fifth among all U. S. colleges and universities in attracting federal research grants and first in the University of California system for the amount of federal research dollars spent on R&D. The November, 2009 passage of the $3 billion California Stem Cell Research Initiative had an immediate, positive effect on San Diego. Five hundred local biotech companies, already employing 25,000 people, are conducting research to alleviate human afflictions such as leukemia, juvenile diabetes, Parkinson’s and Alzheimer’s diseases. Thousands of scientists will be hired here in the next decade, thereby bringing more white-collar jobs, construction and venture capital.